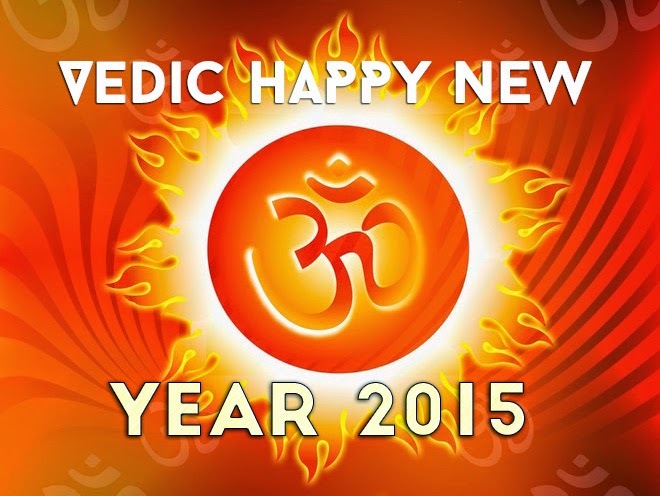 Today, April 14th (IST) of 2015 is the Vedic New Year. The Vedic New Year represents the true New Year, because it’s based on the Sun returning to Aries, the first sign of the zodiac. The Sun’s return to Aries is the most auspicious month of the year to strengthen your personal life force. The Sun, represents the father, political power and your own vitality. Sun in Aries is the right time for you to make important changes in your life. You can turn around your life, your finances, your relationship, your health; all of this can be changed. On the Vedic New Year day, ask yourself how you want to plan and structure your life. This is the best time to do such planning because the energy available at the beginning of the year supports this type of activity. It will be beneficial for you to connect with the Sun on April 14th and everyday for the next 31 days while the Sun is in Aries. Repeat the “The Gayatri Mantra“, 108 times, which will help you get tremendous benefits. April 14th is the day for Sun worship. For maximum benefit, chant the Gayatri mantra all day long. Next Tuesday, April 21st (IST) is the 3rd Waxing Moon called Akshaya Tritiya. Ancient Mystics of India discovered that during an Exalted Sun, the 3rd Waxing Moon energizes the Earth with the consciousness of Non-Declining Wealth. It’s a Moon that contains the consciousness that will not allow any loss and only promote growth. Rationally speaking, this is impossible, but spiritually it is possible. On this day, if you nurture and meditate on the concept of Non-Declining Wealth, it will go deep into your consciousness and create a permanent link with the God and Goddess of Wealth. Keep in mind, that Jupiter will only be exalted for another 3 months and the above alignment will not occur for another 12 years. Thus, be sure to take advantage of all the special power days that remain. Guru Pradosham is a very significant time, as it is connected to wealth and spiritual growth. During the next Guru Pradosham time on April 16th, the Moon will be in the sign of Pisces with the star Purva Bhadrapada. Pisces, Purva Bhadrapada and Thursday are all ruled by Jupiter. Thus, this coming 13th Moon is a pure Guru Pradosham as Jupiter rules the day, star and sign of the Moon. Pisces is the 12th sign of the natural zodiac, signifies enlightenment, and Purva Bhadrapada is ruled by both Jupiter and Lord Kubera, both planet and deity govern wealth. Propitiating Lord Shiva on Guru Pradosham will finally release you from a Guru’s curse. Thus, this coming April 16th is a fantastic opportunity to reset your life. This special Guru Pradosham will also clear karmas that block the blessings that come to you from your Guru. Finally, Guru Pradosham will give you clarity, a sense of confidence and empower you to gain victory over your enemies. In Vedic Astrology, Brihaspati is the name for the planet Jupiter. Brihaspati (also known as Guru), is considered to be the most beneficial of the planets and rules the element ether (space). This element indicates vastness, growth and expansion in a person’s life. Brihaspati also represents the balance of past karma, religion, philosophy and knowledge. Worship of Brihaspati (Jupiter) results in cures from ailments affecting the stomach and helps ward off sins.